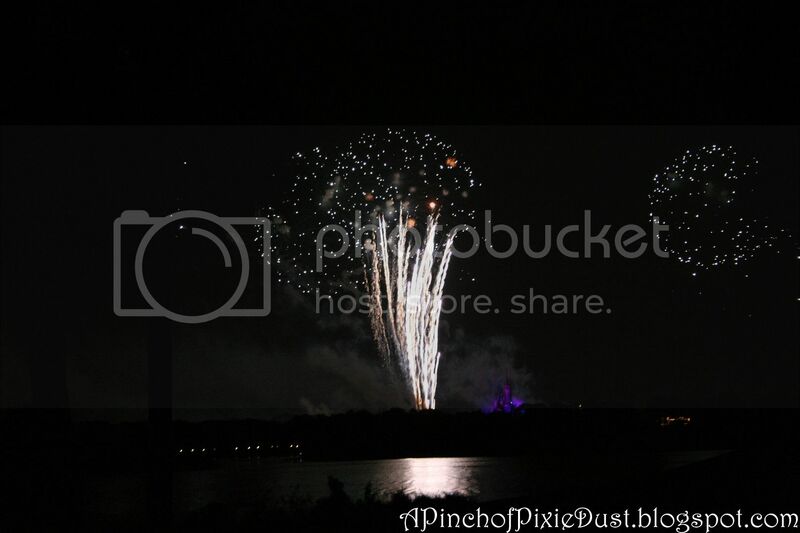 Sometimes the most magical viewings of the Wishes fireworks aren't the ones that are planned. Sometimes the most memorable viewings are when you catch a glimpse of Wishes unexpectedly, or when you can just step out of your room or out of dinner and watch the show - even without the soundtrack it's beautiful. And if you're a Disney person, then you've probably already got the soundtrack memorized in your head! 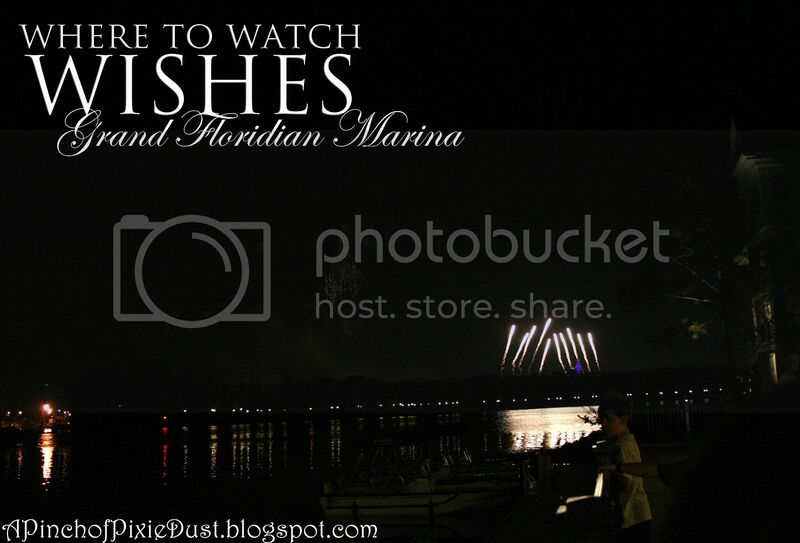 Today's post is dedicated to just such a spot, at the Grand Floridian Marina. The marina at the Grand is U-shaped...at the bottom of the "U" is Gasparilla Grill and Games (number 21) and all the outdoor seating. There's a little terrace there right by the water where they sometimes do parties - often it'll be roped off during Wishes for said parties. 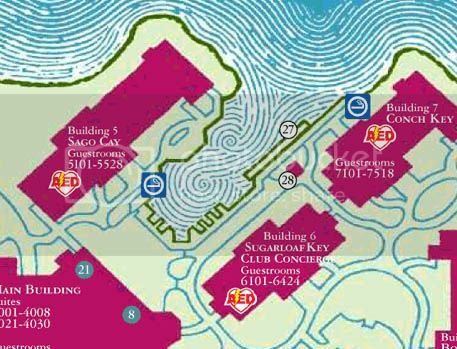 But if you want to get a little closer to the castle and away from the crowds, venture up the right side of the "U" - along the back of Sugar Loaf and Conch Key, where number 27 is on the map. This is a magical spot. If you listen carefully, you can hear the music echoing from the speakers outside Gasparilla and from the other side of on the boat dock. These whispers of the soundtrack are just enough - your memory will be able to fill in the rest of the melody! The elegant white gingerbread balconies of the Grand on either side of you are lit up in all different colors by the bright bursts of light from the fireworks. The street lamps across the water look like a string of Christmas lights bedecking the opposite shore. Wishes is such a popular show - unless you have your own balcony to watch from, chances are there will be other people around. 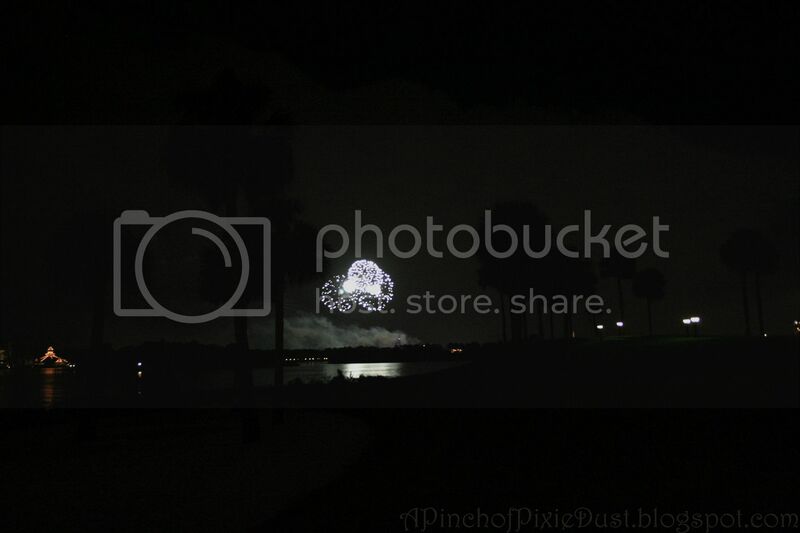 But the Grand Floridian marina is one spot that you'll usually have all to yourself. 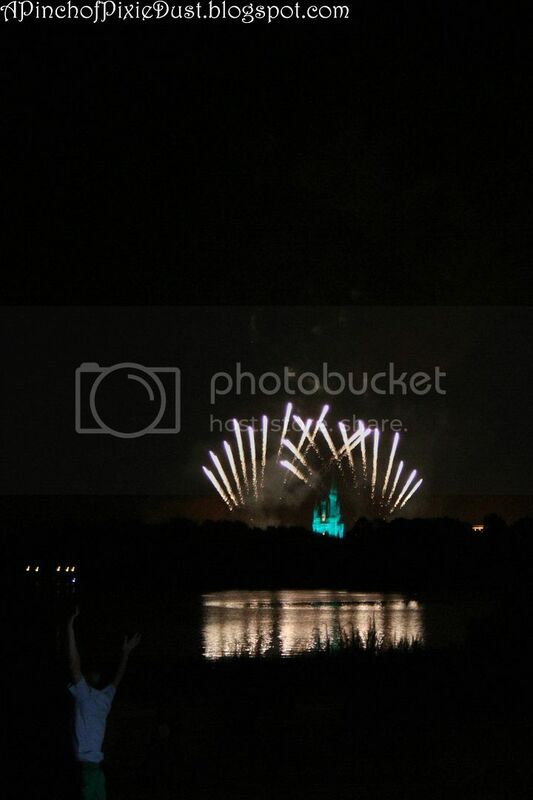 The rest of the world melts away, and it's just you, the castle, and the fireworks. Totally Random Tidbit: The marina at the Grand Floridian is called the Captain's Shipyard. I am a day late with this trivia post but not, I hope, a dollar short! Any ideas where in WDW this noble stone steed might be found?? Good job to Mike for guessing last week's photo -- those pressed penny machines are from the Boardwalk lobby, right outside Dundy's Sundries (the gift shop). Ready for a blast from the past?? 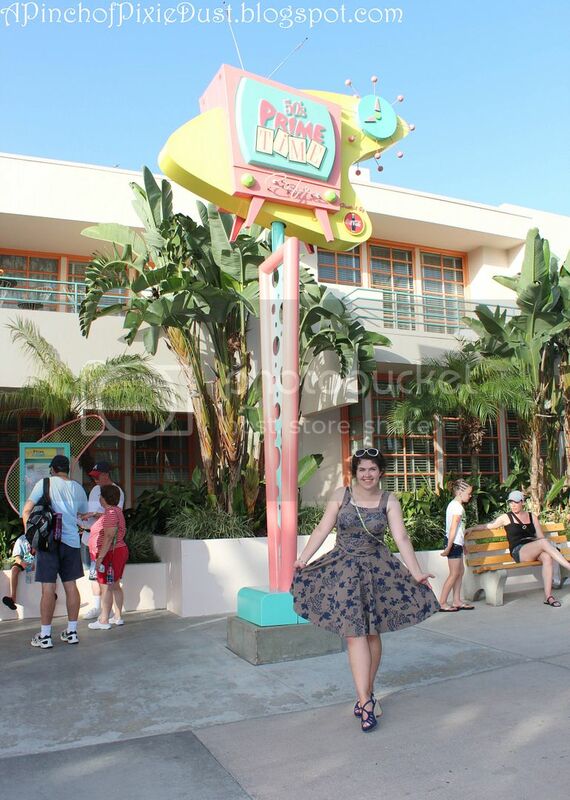 For this week's sweet treat we're heading to the 50's Prime Time Cafe at Hollywood Studios. Prime Time is so colorful, both inside and out - I love it! 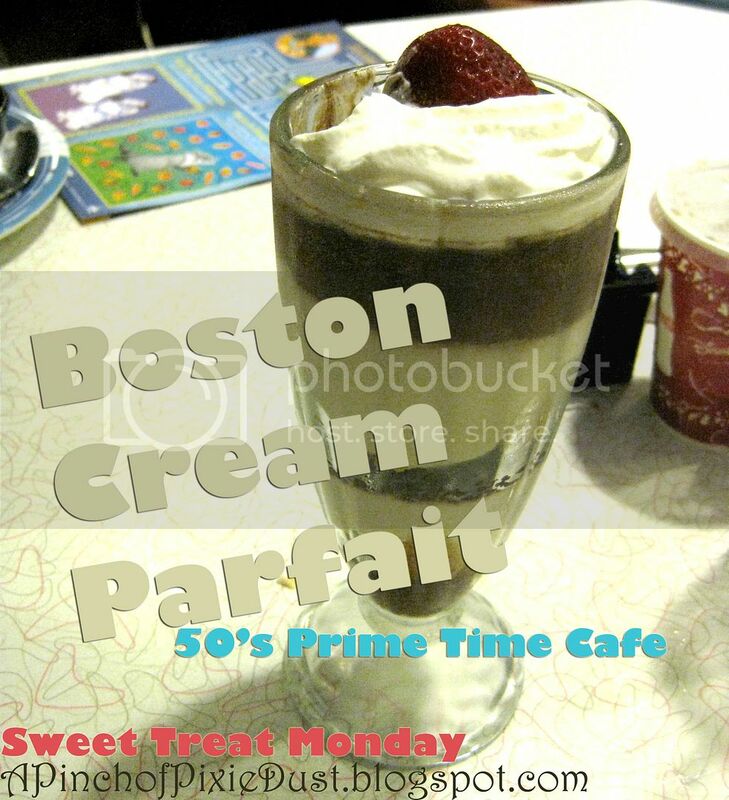 The 50's Boston Cream Parfait is the dessert of the day! I've read mixed reviews of this online, but when I tried it this past July, I LOVED it. It consists of layers of chocolate fudge, vanilla cream, and pound cake, topped with whipped cream and a strawberry (strawberry is the new cherry ). I'm picky about my cream...I don't like it when it's too much like custard, and I don't like it when it's made with fake ingredients that give it a weird aftertaste. But this cream was delish - light and frothy and just right! The chocolate, I was also delighted to find, was a thicker chocolate fudge rather than a chocolate pudding. And the pound cake in there added just the finishing touch. Definitely a FAB sweet treat! Ready to put on your thinking caps? I've got a new Disney trivia challenge for you! 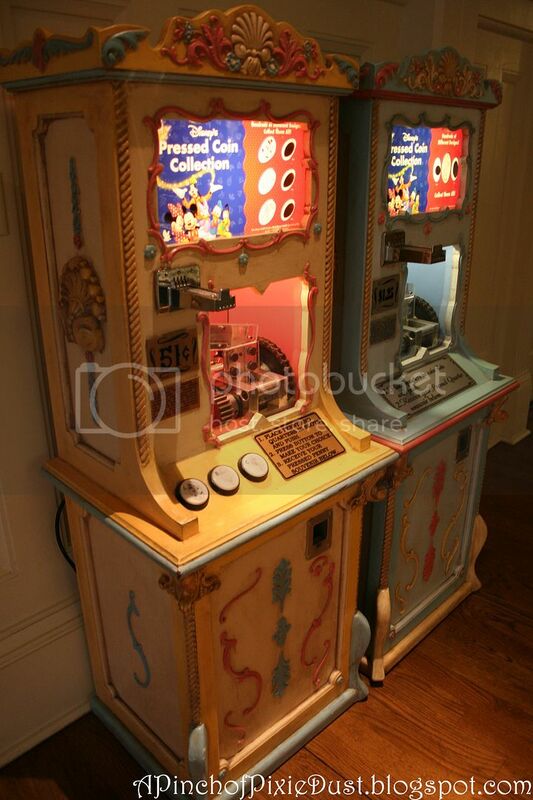 These two cheerful, colorful, prettiful pressed penny machines have a home in some corner of Walt Disney World. Do you know where that is?? 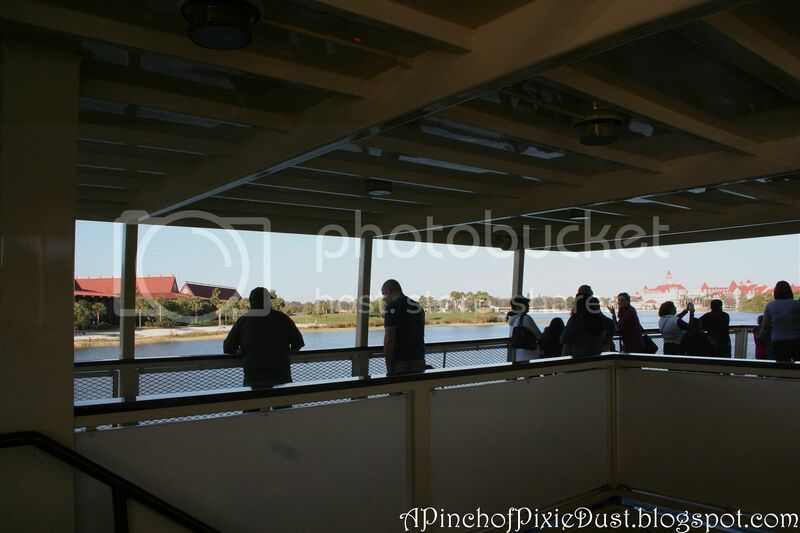 Great job to Brielle and Lisa for spotting last week's photo - that view of the Seven Seas Lagoon is from the upper deck of the ferry to the Magic Kingdom! 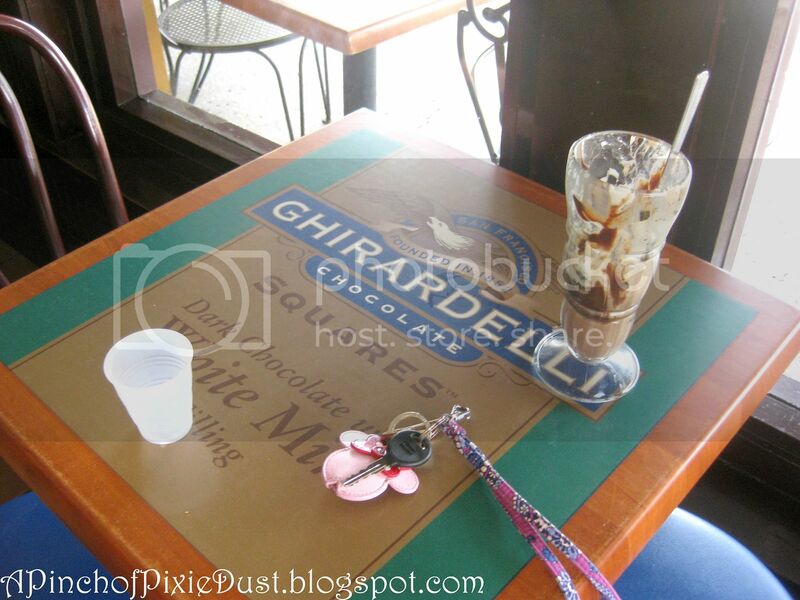 I used to have a prejudice against the Ghirardelli Chocolate Cafe at Downtown Disney, because it's not a blatantly Disney brand. 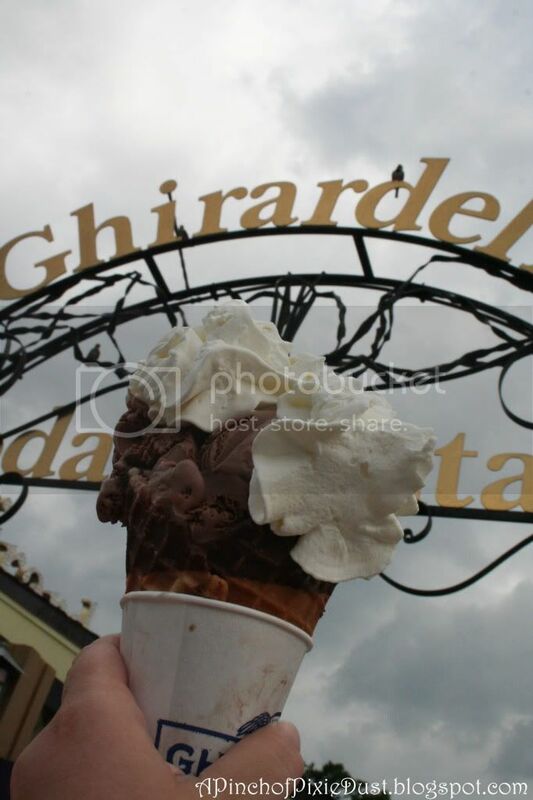 I thought, "I can get ghirardelli chocolate anywhere." Then one day I actually went in, and one incredibly chocolaty ice cream cone later, my mind was completely changed. This place is amazing. It may not be Disney, but the theming is still great - the tables are shaped like chocolate squares. That's pretty cool. His parents are raising him right. 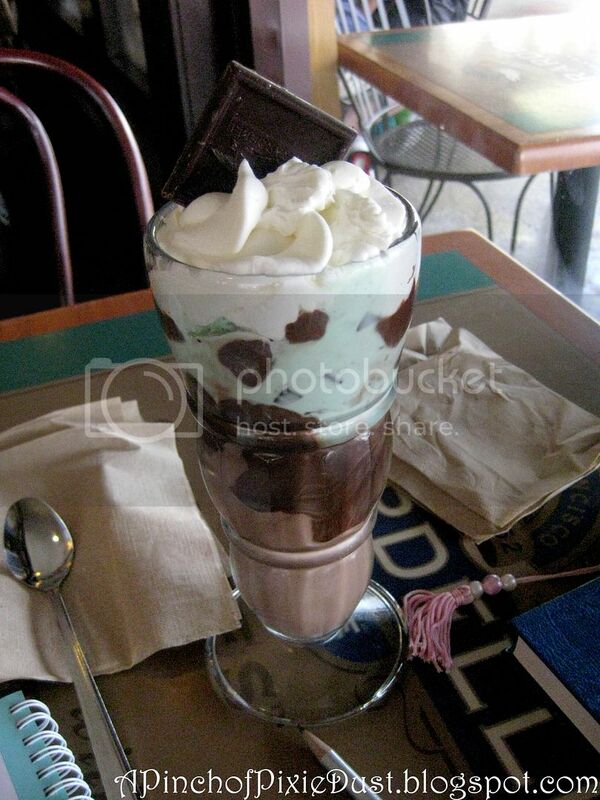 So today's sweet treat is an Intense Dark, Mint Bliss Sundae!! This was SO GOOD. One scoop of mint chip ice cream. One scoop of chocolate ice cream. Dark chocolate hot fudge (which was pretty much the best hot fudge you've ever had...PURE chocolate! 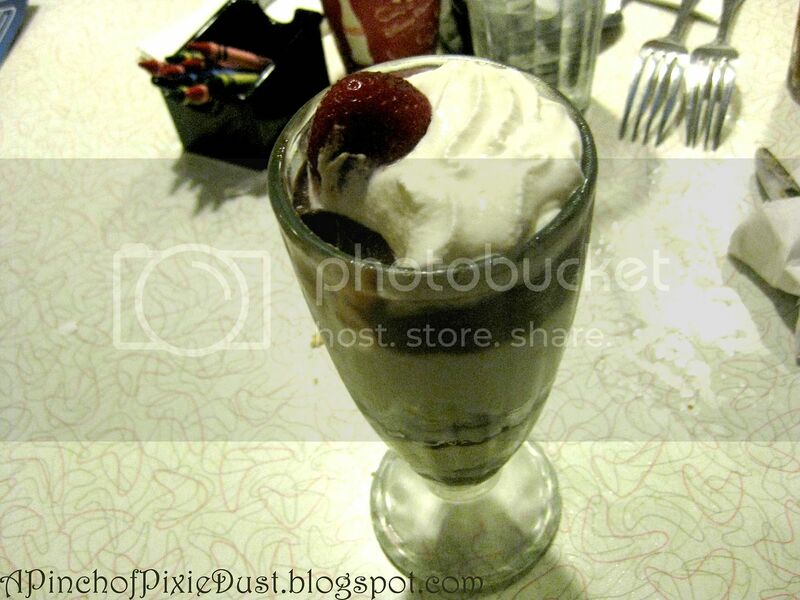 ), whipped cream and a square of Mint Bliss Intense chocolate. It was the perfect mix of rich chocolate and refreshing mint. The size was great too -- I couldn't finish it, so I got a to-go cup and brought the rest along. 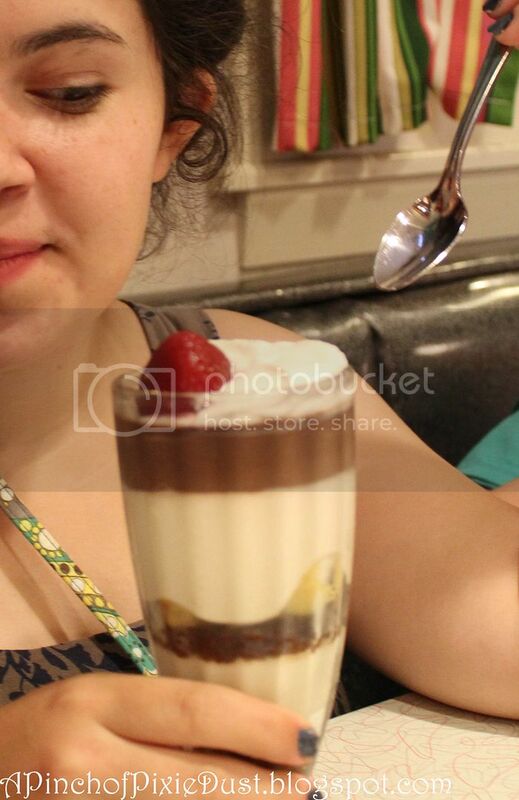 I would highly recommend this sundae...I want another one just thinking about it! Here is another post for all you Wishes fans! 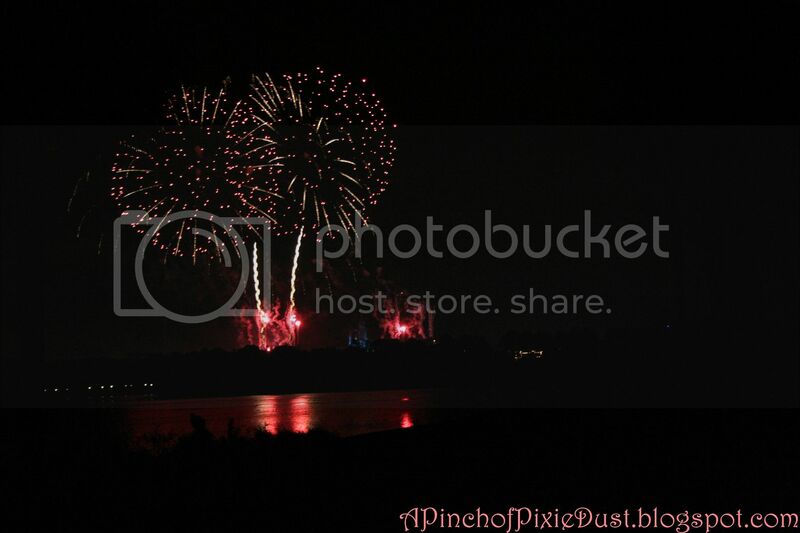 We're going to take at a look at another popular perspective of the gorgeous Magic Kingdom fireworks show. For this vantage point, you don't even have to enter the park. All you have to do is head for the beach! ...the POLYNESIAN beach that is!! 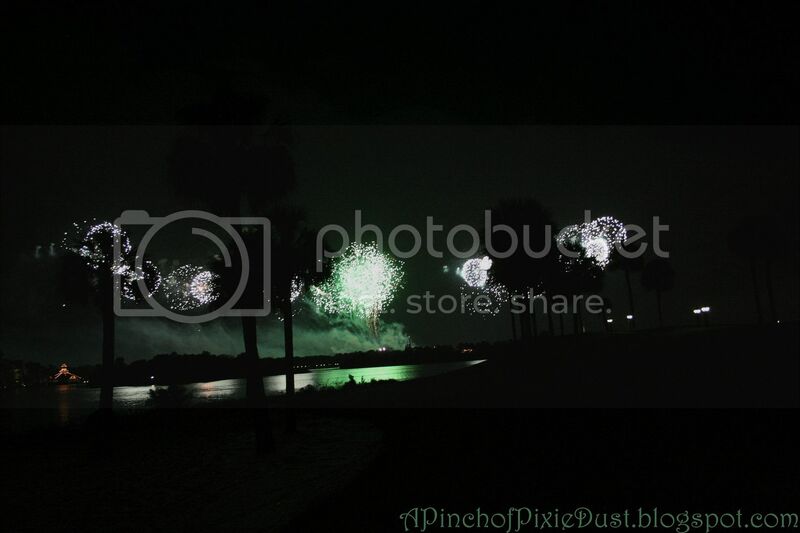 There are fabulous spots to watch the fireworks all along the Polynesian Resort's beachfront and Sunset Pointe (where the above photo was taken). 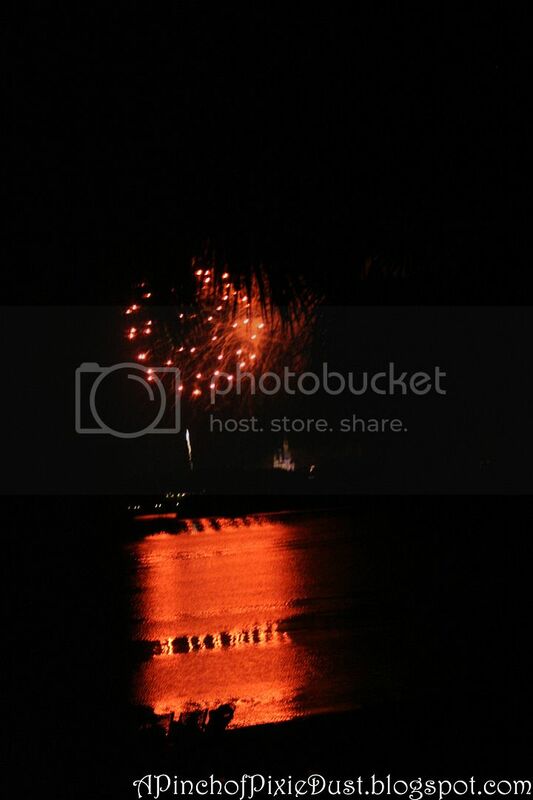 Whenever I'm staying at the Polynesian, I LOVE that I can just pop out from my room to catch the fireworks. Even when I wasn't staying there, I would often go over just for the evening, to have a little snack at Captain Cook's then sit in a hammock and watch the stars until it was time for Wishes. 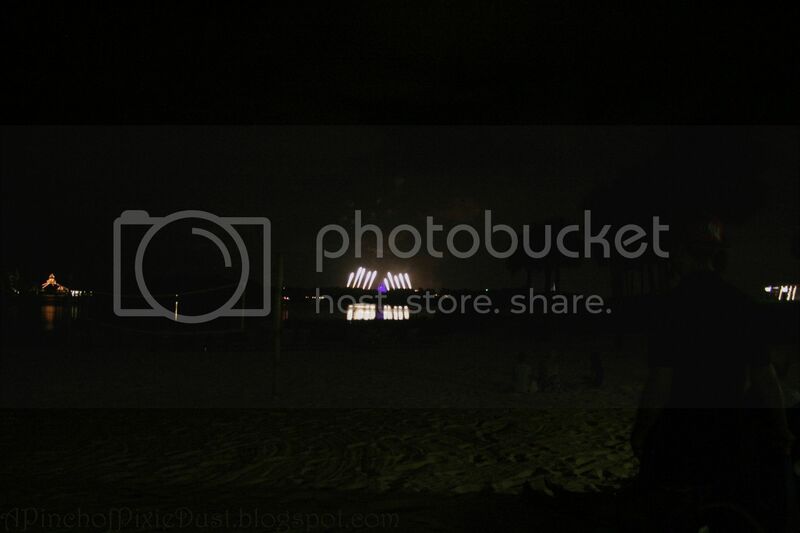 If you're on the beach at 9pm you'll catch a bonus nighttime show - the Electrical Water Pageant! It has been playing at the Polynesian beach, every night at 9pm, since 1971. How awesome is that? 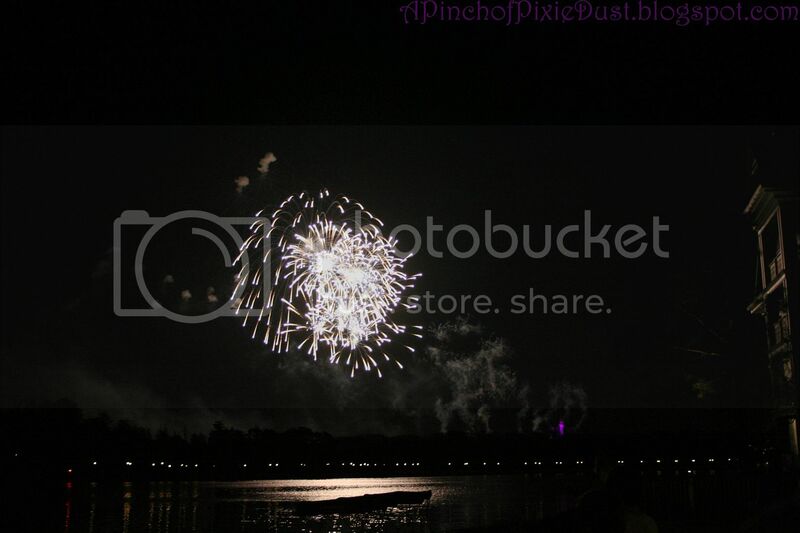 The great thing about watching Wishes at the Polynesian is that there are so many spots with great perspectives. It's almost never crowded. You get the castle. 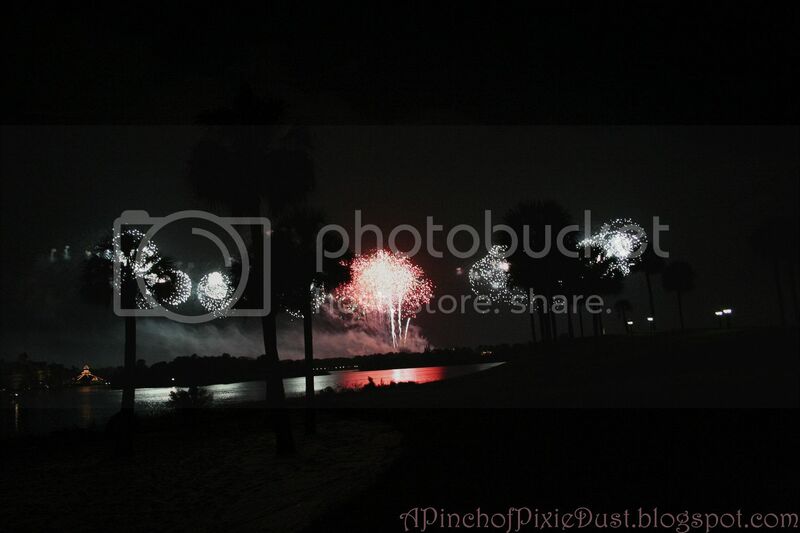 You get the beautiful bursts of pixie dust. You get those bursts reflected across the lagoon. And then you get it all framed by palm trees. 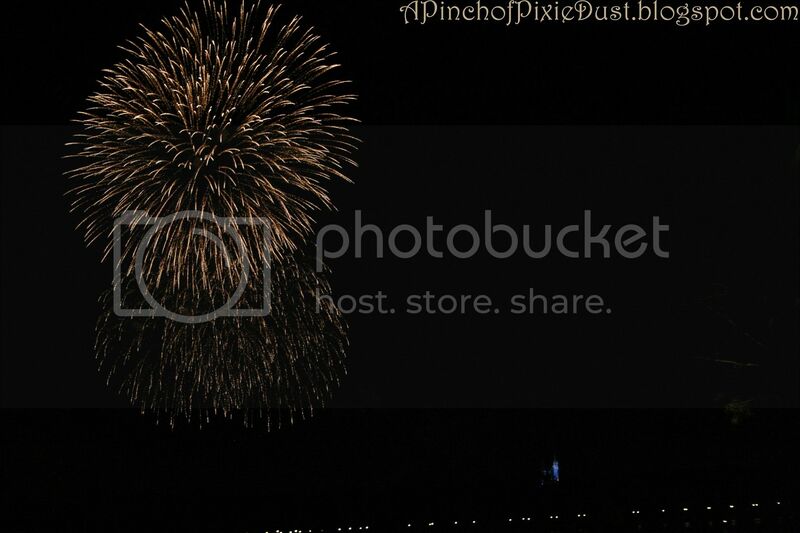 The Polynesian is also a great place to watch special event fireworks if you don't want to have to actually attend the event or be in the park on a crowded day. 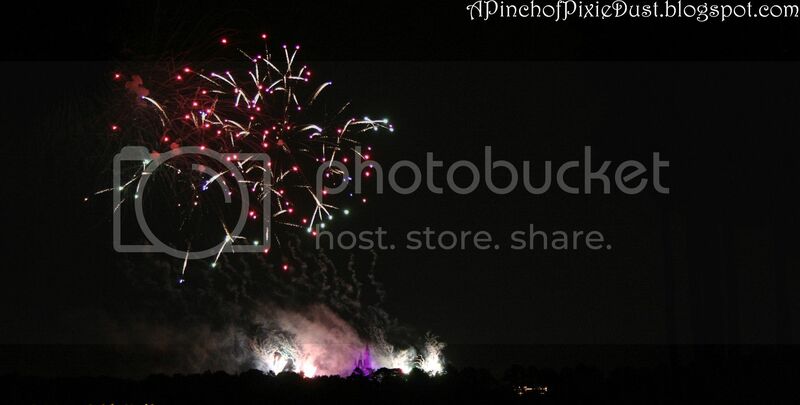 Here are the fireworks from Mickey's Very Merry Christmas Party. I can't remember if they pumped in the music for the Christmas fireworks...I seem to recall I could hear it, but it was really soft. The Wishes soundtrack you can hear very well - but I always bring along my ipod (which has the soundtrack on it) just in case! 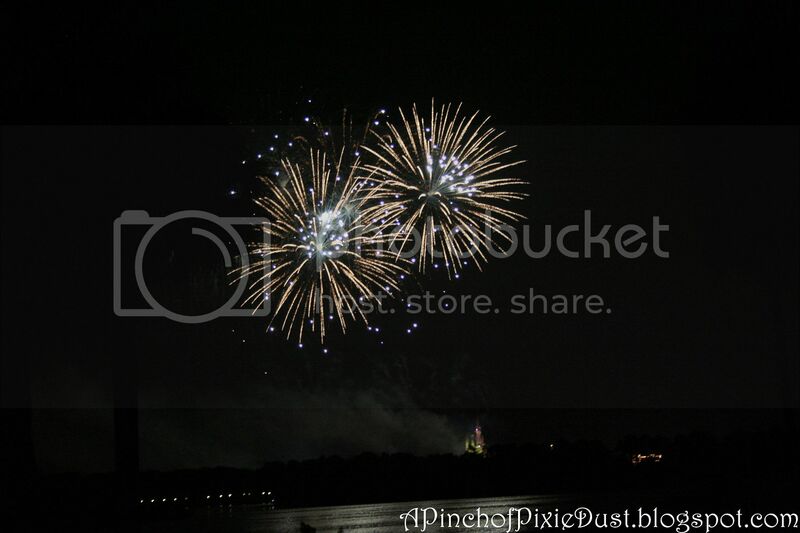 The finale of the special fireworks show is always the BEST. I mean, the stream of fireworks at the usual Wishes is incredible, but this one is just BOSS. 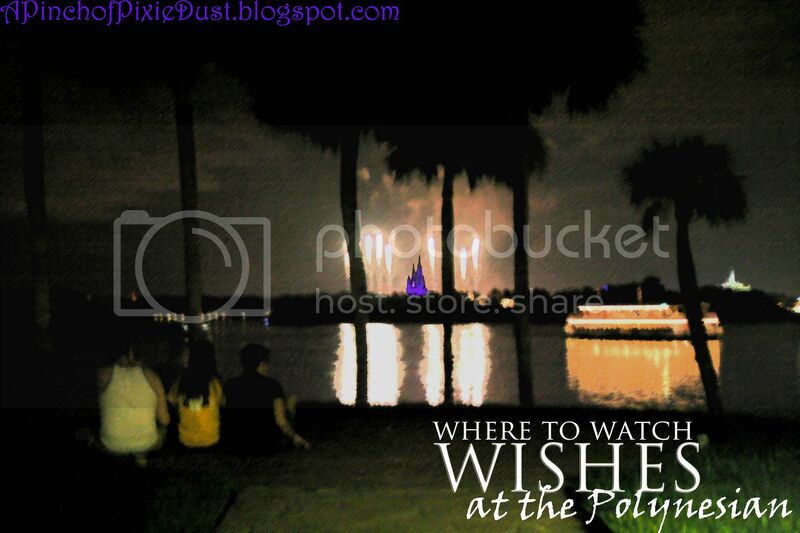 The Polynesian is also a great place to watch the finale, because you can see the fireworks filling the horizon! Red and green for Christmas! One last photo from a regular Wishes night...I love the little boy in the foreground. A Slice of the Seven Seas Lagoon. Welcome to another Wednesday Where trivia post, friends! This week's photo is a view of the seven seas lagoon that I bet you've seen before...but do you know where you've seen it from? P.S. 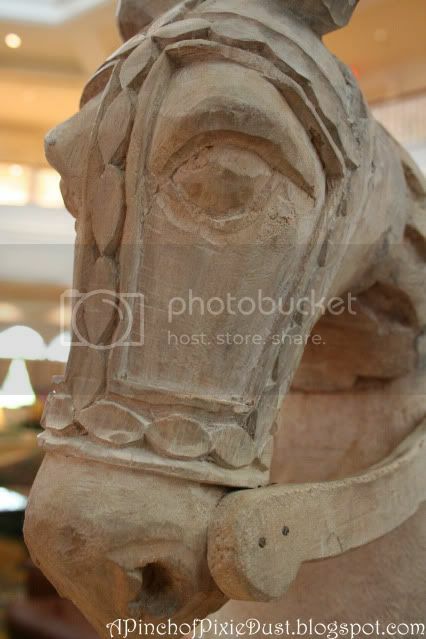 Great guessing on last week's photo...it was indeed from the Mexico pavillion. Go up the steps of the big Mayan temple, but instead of going inside, walk around to the left, and you'll find a little terrace surrounded by all that tropical foliage! 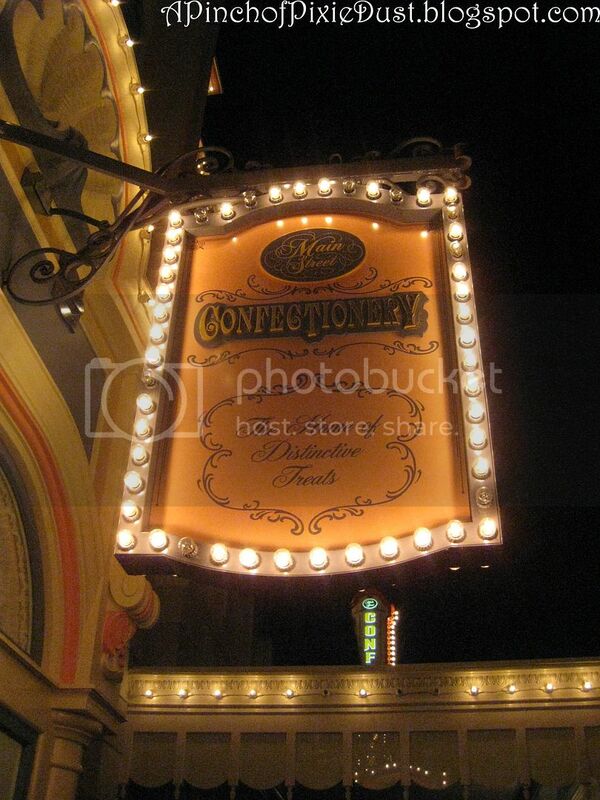 The Confectionery!! "The Home of Distinctive Treats." 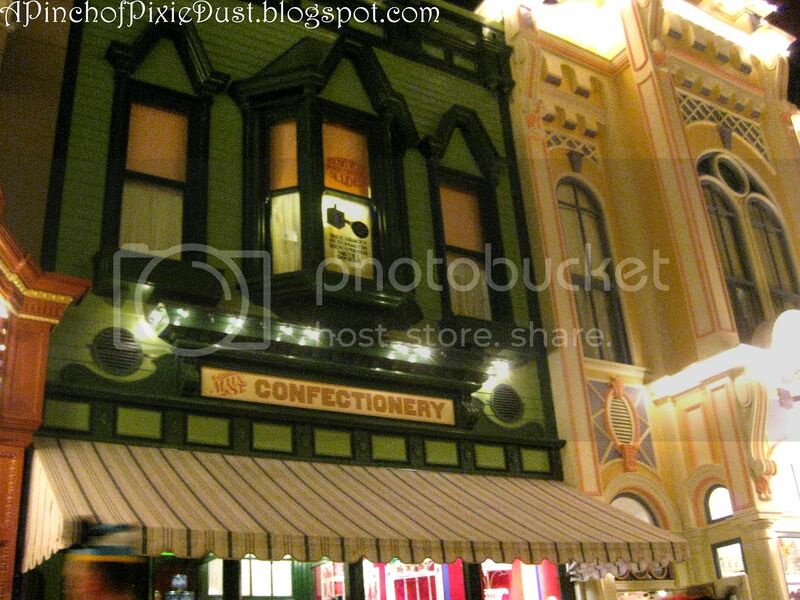 The Confectionery experience starts before you even step in the doors...I mean look at how cute the exterior is. I love the yellow facade most! 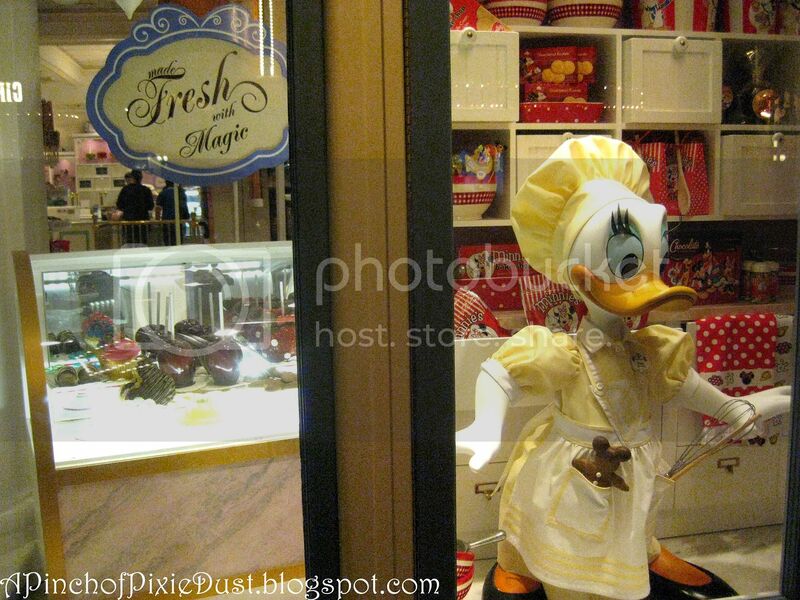 Her outfit looks exactly like the costume the cast members wear inside...right down to the frilly apron and name badge! 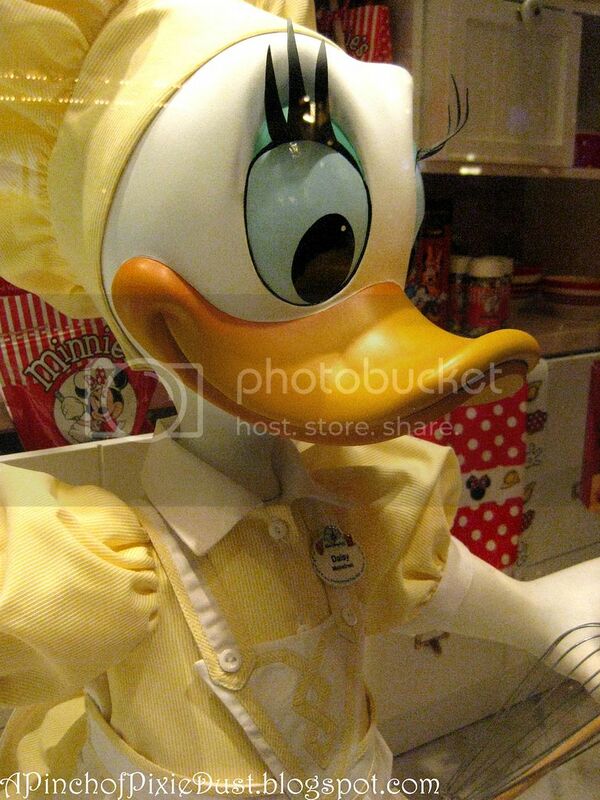 But we aren't here to talk about ducks (no offense Daisy). We're talking about treats! 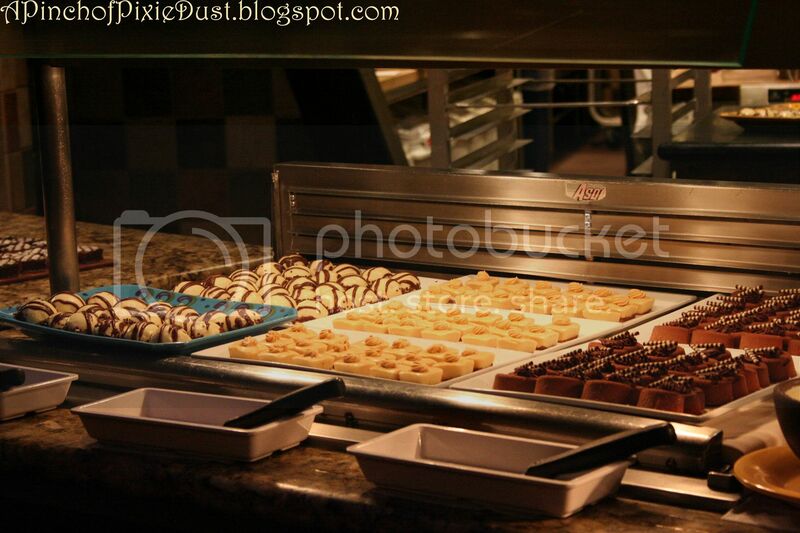 There are so many gorgeous treats at the Confectionery, it's hard to choose one. I love how they just surround you with sweet sights, like colorful cotton candy spinning itself out of thin air and caramel apples getting a perfect chocolate drizzle. 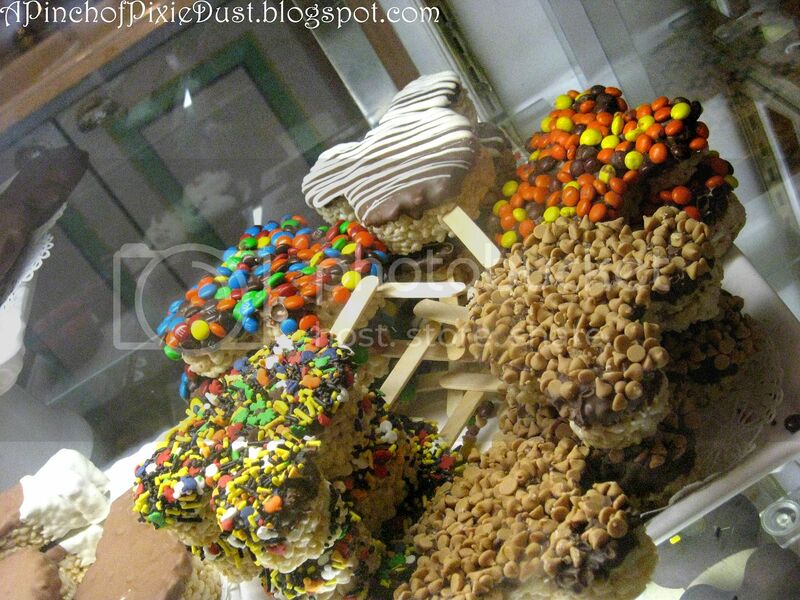 These beautiful, gourmet, Mickey-shaped rice crispie treats cost $4.95 - and yes, they count as a snack credit. I know because I once used a snack credit on them, and the CM that was ringing me up was surprised too, but the little snack icon was right there on the price label. There are plenty of $3.95 snack credit items, but I think $4.95 might be a record! I chose the mini M&M covered Mickey, and it was delish. Sadly I don't have a photo of it because I was too busy eating it. Sorry! 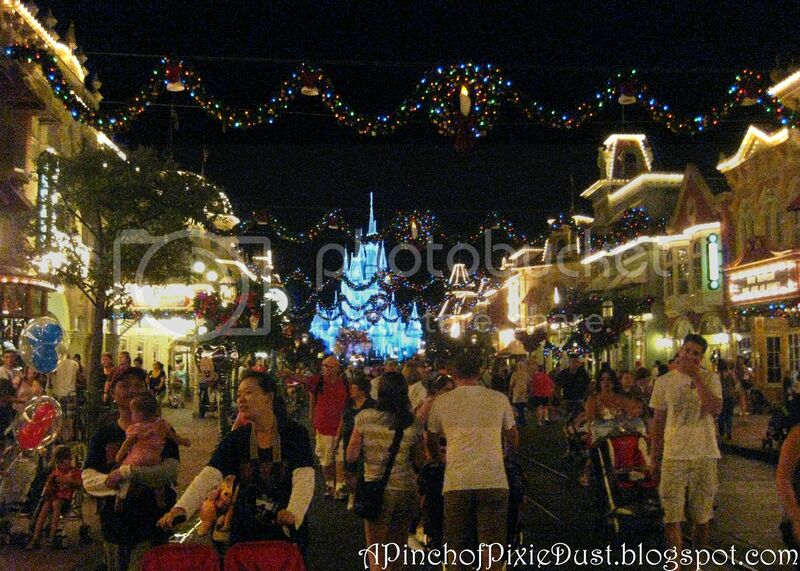 One more Main Street picture - because this is what the MK is starting to look like! Hope it's a Happy Monday! 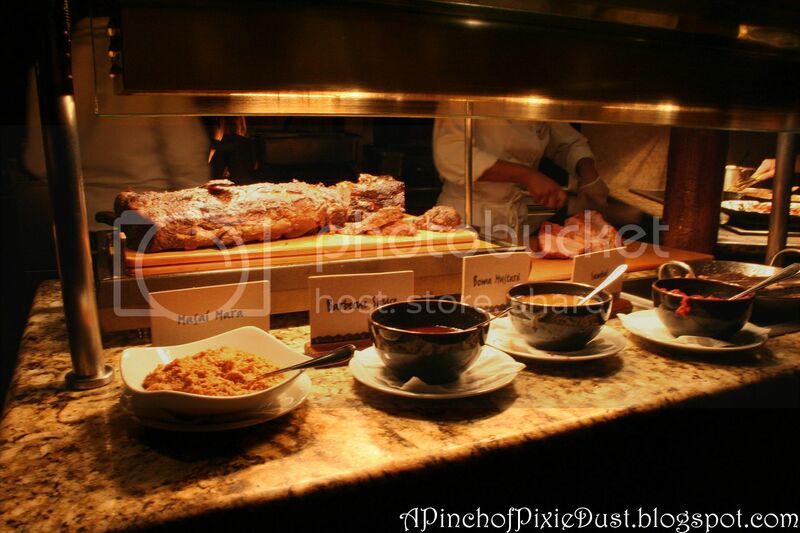 If there's one restaurant at Disney I could go to again and again and again and never get tired of, it would have to be BOMA. OK, so actually that's a little bit of hyperbole, because obviously there are lots of utterly wonderful Disney restaurants - I mean, I've experienced dinner at Ohana's now too, and that's probably at least eqaul, but - it's just there's something about BOMA. 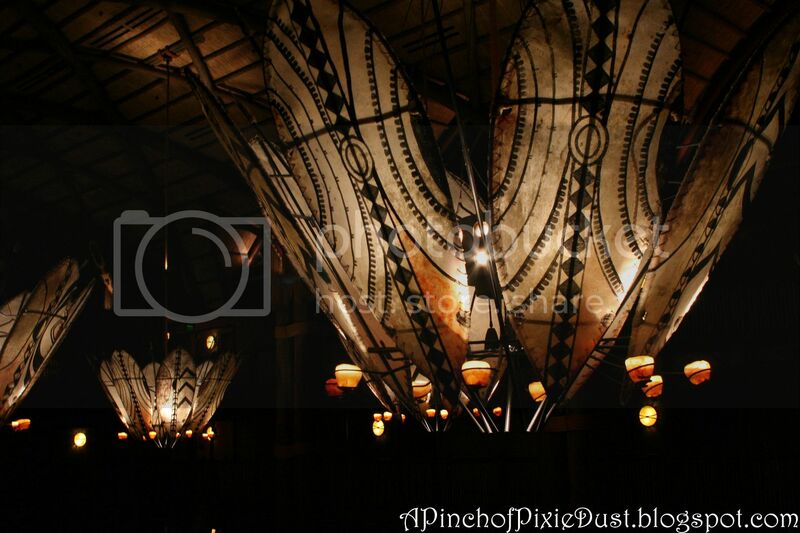 The mere thought of BOMA makes my heart skip a little and brings a giddy, greedy light into my eye. I'm speaking of the dinner buffet, of course - nothing against breakfast; it's just you wouldn't get to experience BOMA's fourteen amazing desserts if you went to breakfast. I wish I could increase my stomach capacity by at least a hundred when I go to BOMA. 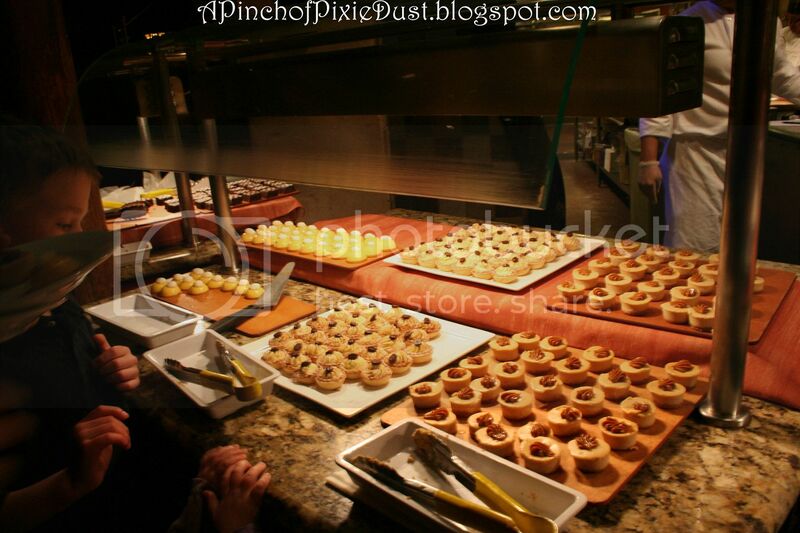 And even when I'm just finishing dinner there and stumbling out into the gorgeous Jambo House lobby, stuffed to the gills, I immediately wish I could be magically hungry again and turn around and go back in and eat it all over again. 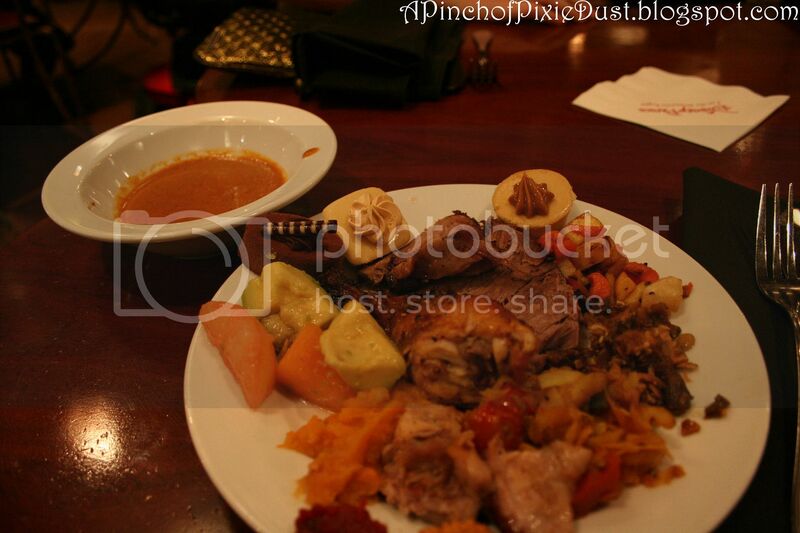 It's such a wonderful meal, that you always have to type it BOMA. A mere "boma" or even "Boma" couldn't possibly express its wonderfulness. To express all the excitement, all the beauty, all the flavor, you've gotta say it in ALL CAPS. 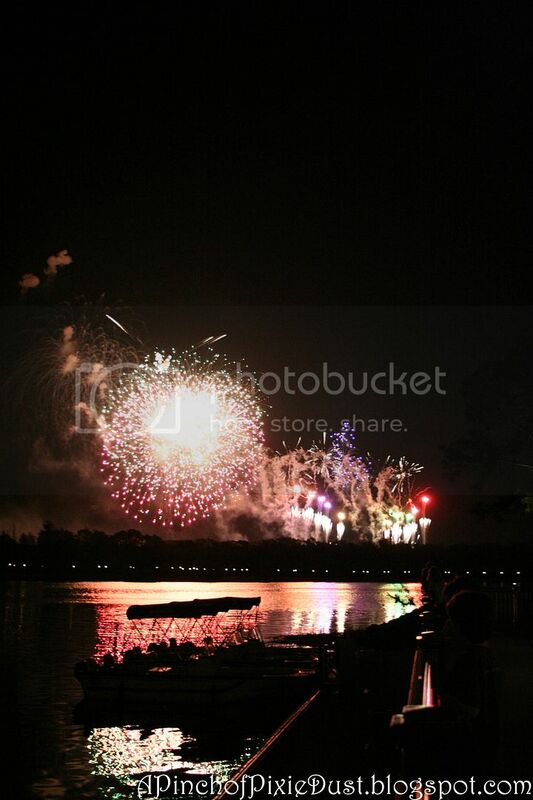 About this time last year, I had been working at Disney for a few months and was starting to feel the BOMA pull. Luckily I had made some friends at the Boardwalk who were of the same mind, so we made a plan and an ADR - we were going to BOMA. All the week beforehand, as we went about our work on the curbside and at the Front Desk, our upcoming meal was all we could talk about. At the mere mention of the work BOMA we would do a mini happy dance. And then at last the great day came. I don't think I even ate breakfast. I definitely didn't eat lunch. I needed maximum hunger for DINNER! 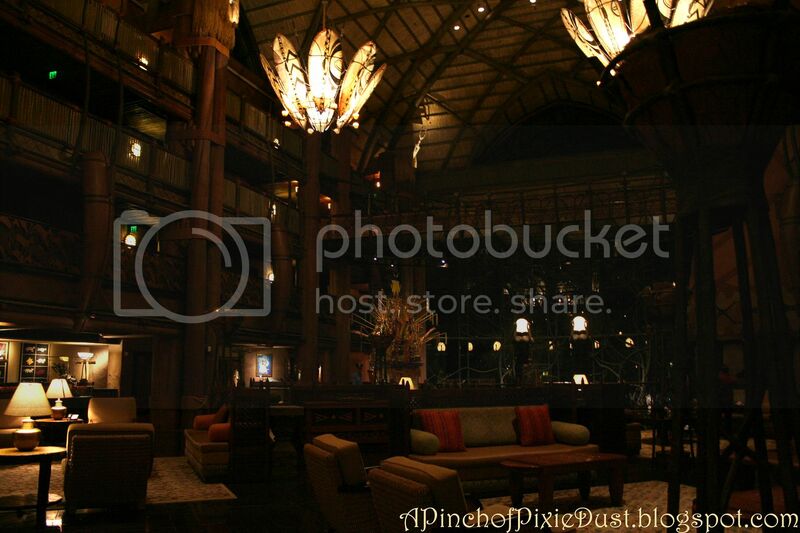 We waited in the lovely Animal Kingdom Lodge lobby until our whole group was assembled, then headed down to the first floor! 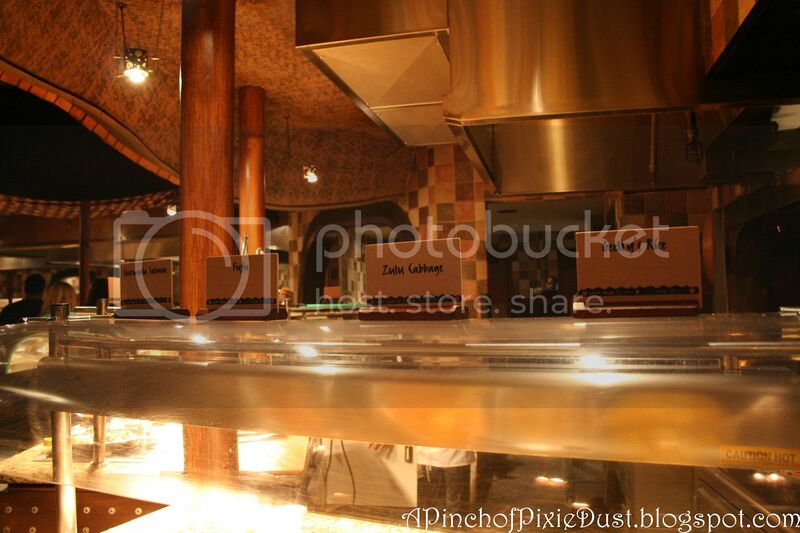 One of the many things I love about BOMA is how exotic all the dishes are. 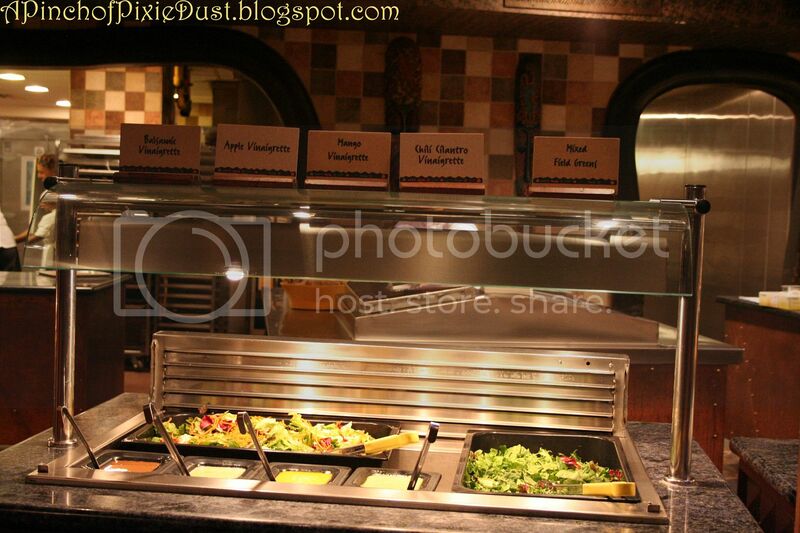 These were the names that greeted me when I first approached the buffet - Geelry's Rice, Zulu Cabbage, Fufu, and Chermoula Salmon. You don't even know what half of those names mean, but you know they're going to be delicious! This was the chermoula salmon -- chermoula is a delicious, Moroccan marinade and there were also pistachios involved. I tried a little and it was fantastic! In case you're wondering, fufu is like mashed sweet potoates. Next came the MEAT. 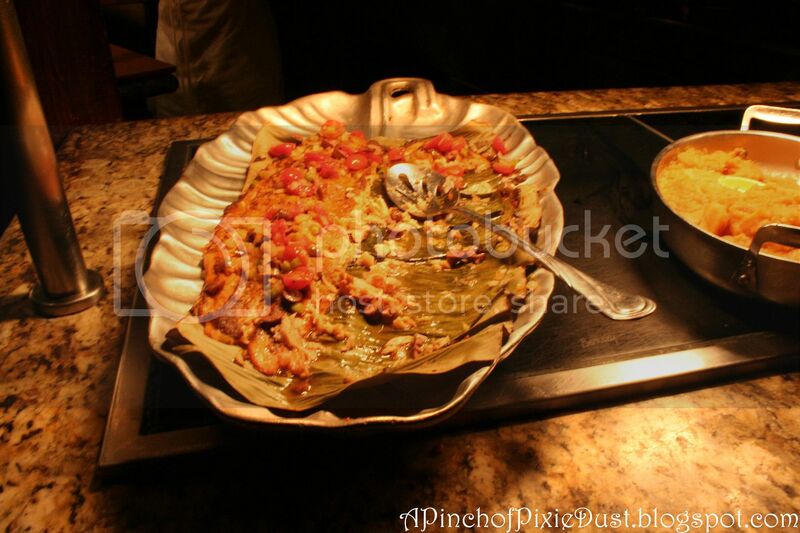 I think there was something kinda out there simmering on that pan, like pork shoulder, but I bravely tried it (you gotta be brave and try everything when you're at Boma), and it was surprisingly tasty! Also prime rib and pork I believe, and lots of spicy sauces! ...with more crazy names! I think chakalaka is my favorite name. for anything. ever. :) I never thought the sweet corn and spinach pudding looked very appetizing, but one of my friends swore by it, so I gave it a try -- it was really smooth and lovely! Then the SOUPS! And we're barely halfway through the buffet, friends. These were curried coconut seafood stew, zanzibar katoga soup (that's the one I tried - thick and smooth and really flavourful! 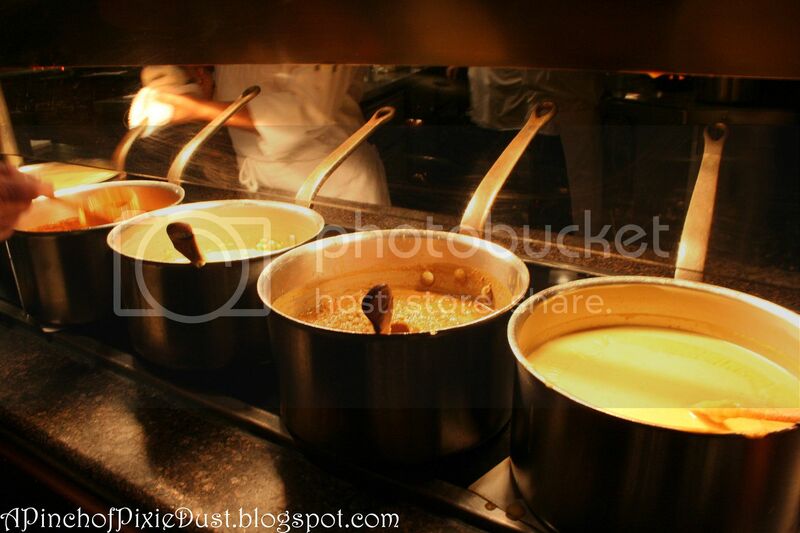 ), chicken corn porridge, lentin and sausage soup, butternut squash soup, and I'm fairly certain they had the classic peanut soup as well! Next came the cold salads - I could've had a huge dinner with them alone! 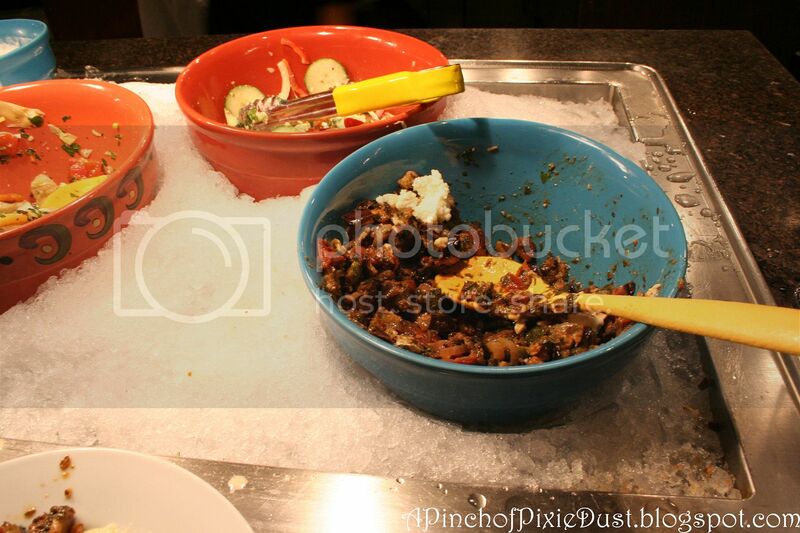 This was the olive salad. They also had papya, grapefruit, and AVOCADO salad (such a delicious but unexpected combination! ); watermelon rind salad; spinach and quinoa salad; kool slai (like cole slaw...sorta); and curry pasta salad (AMAZING). There were also a few others (if you can believe that!) - a potato one, a cucumber one, an artichoke one - but sadly I didn't take a photo of the names, so I can't remember what they were called! Even the ordinary garden greens have such exotic dressings - apple vinaigrette, mango vinaigrette, chili cilantro vinaigrette! Be still. My heart. These are my three favorites - cinnamon chocolate mousse, peanut butter mousse, and the incomparable ZEBRA DOME. ALSO caramel cheesecake and kenyan coffee tartlets and a FANTASMASTIC passion fruit dome. Not pictured, but also there: several varieties of cookies, brownies, a fruit cobbler, and a lovely banana and butterscotch bread pudding that I tried for the first time. 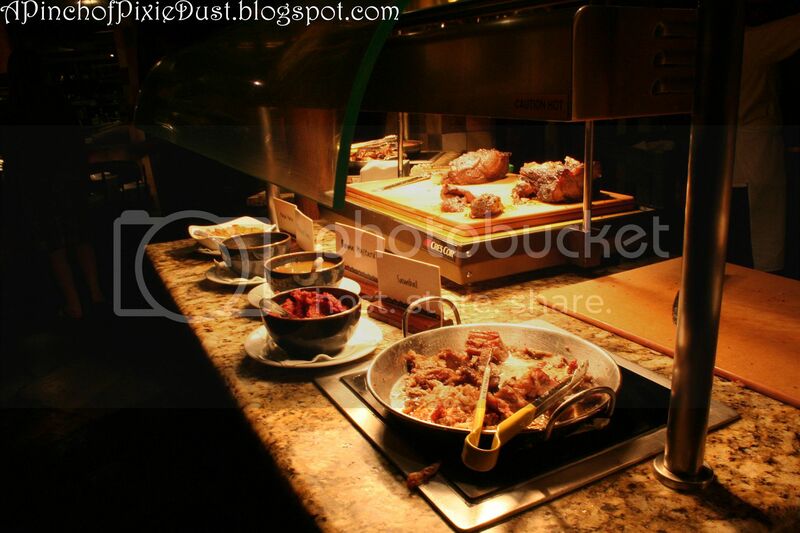 I don't think I even mentioned every item of food on the buffet - if you guys can think of something I missed, you'll have to post it in the comments. A few others were the really tasty spicy durban chicken, some kid's items, cornbread (or mealie bread), pita bread and hummus, and even fruit. I mean, who is possibly going to have room to eat FRUIT with everything else to try??? 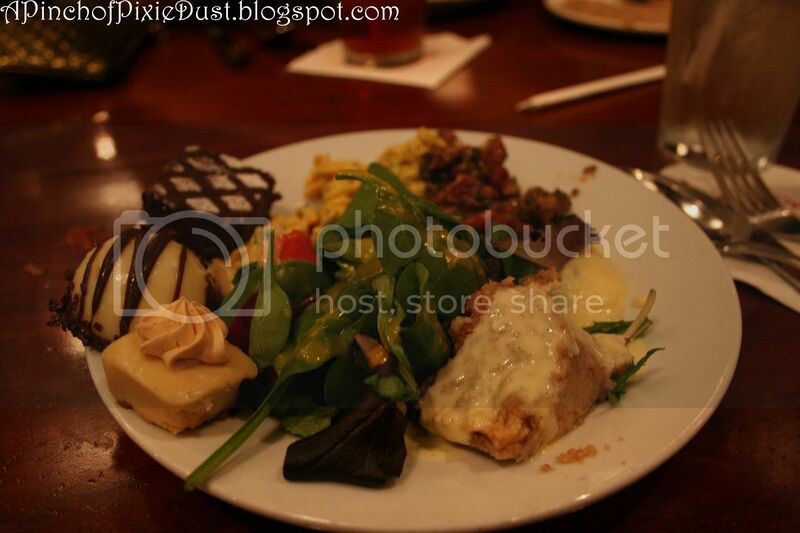 This was my second plate. You're still not judging, right?? At least it had spinach on it! I should add, to prove I'm not a total glutton, that it was a long dinner and I did not actually finish every last thing on those plates. I had POG (passion orange guava) juice to drink, and I think that was my undoing. It was a little filling - I should have stuck with water. One of my friends has a little zebra named Curby she carries in her purse like a mascot (because she's awesome like that), and this is how Curby felt by the end of the meal. 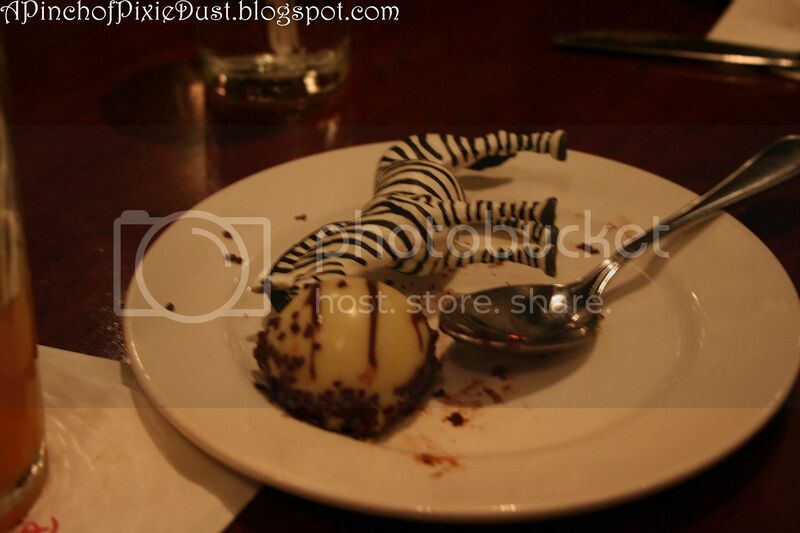 I could definitely feel the zebra. 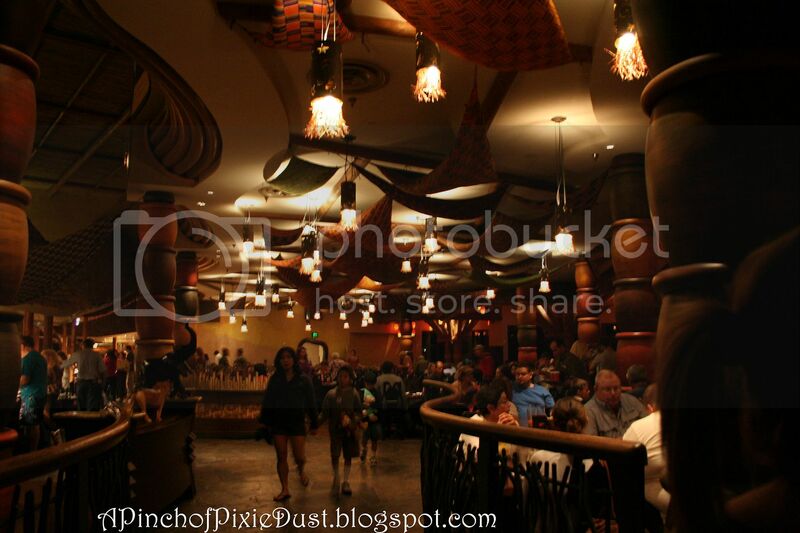 I felt like someone was going to have to roll me out of Boma, I was SO full. I did manage to make it out on my own, though, and a stroll around the lobby and out to Arusha Rock was the perfect after-dinner activity to bring me out of my food-induced stupor. Writing this update has been cathartic. 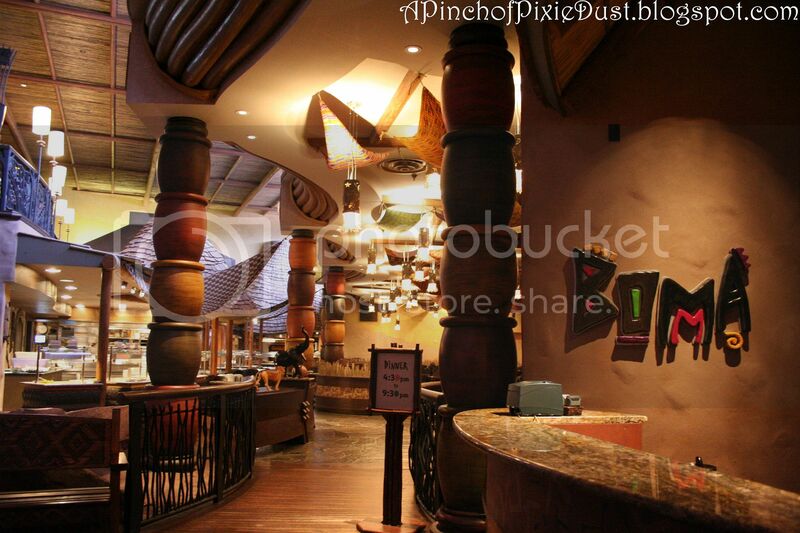 I feel like I've been back to BOMA and tasted all that deliciousness all over again.